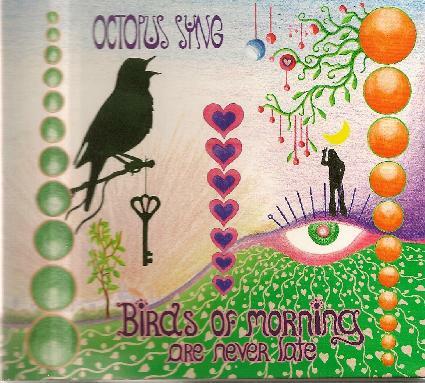 Octopus Syng - "Birds of Morning Are Never Late"
Octopus Syng is a one man band consisting of Jaire from Helsinki, Finland on vocals, electric and acoustic guitars, bass, drums, organ, keyboards, effects and percussion. The music is firmly in the 60s influenced folk-psychedelic, flower power pop-psych, San Francisco mold, and Jaire is a master craftsman in these arts. Birds of Morning Are Never Late is his second album, the first being the equally wonderful Beyond The Karmadelic Coldness, There's The Lovedelic Warmth. The 11 songs on the album are lovingly and respectfully retro and beautifully produced, with sophisticated arrangements. Honestly, this music sounds like it was recorded in the Summer of Love. And Jaire has an incredible flair for songwriting and melody. Cross Syd-era Floyd with Ray Davies and a parade of 60s West Coast bands and you'll get something like Octopus Syng. The music is laced with seductively lulling melodies and vocals, though Jaire isn't afraid to rock out and can get wildly acidic at times too. The album is fully solo, with all instruments played by Jaire. But check out his Myspace page (link below) for full band live performance videos. HIGHLY recommended. For more information you can visit the Octopus Syng web site at: http://www.myspace.com/octopussyng.